Whether you are brand new to Cricut or having been using Design Space a while, it can sometimes be a little intimidating. Today, I have 12 Design Space tips and tricks that are sure to help you feel like a Design Space boss! First, let me introduce myself. My name is Brandi and I blog at Creative Cutting Classroom, a blog about crafting with the Cricut. I am so excited to get to share with you some of my favorite Design Space tips! I hope these will help you feel more confident in using Design Space. When you are first getting started in Design Space, I think it is best to ease in and not try to learn everything at once. Make It Now projects are projects that have already been designed, all you have to do is cut. They are perfect for beginners or those of us who don’t want to spend tons of time designing from scratch. The best part of Make it Now projects? You can customize them to make them your own! To customize a Make It Now project, click on the image of the project you want to make. It will open and show the materials you need and instructions. Normally, you would just click “Make It” and it will go to the cutting mat. If you click the “Customize” button it will open where you can change anything you want. 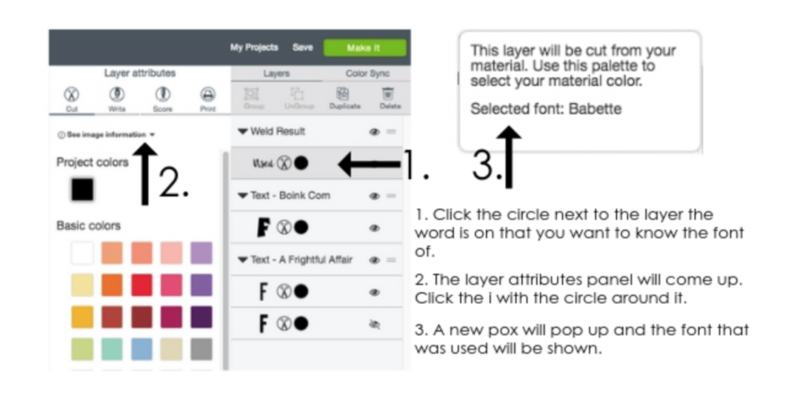 It is a great starting point for your projects and you can customize them to make them your own! If you like the idea of projects that are already designed, you may want to check out the community section in Design Space. Did you know that you can create a profile and share your creations? It’s a relatively new feature, but it is so fun to see other Cricut users and what they create. They work just like the Make It Now projects, but they are designed by Cricut users instead of Cricut themselves. Once you are ready to design your own projects in Design Space, you will soon realize that there are tons of images to choose from! One way that I keep from spending all of my crafting time scrolling through images is to filter them. Images can be filtered in numerous ways. The first option is whether you are wanting to look for images that are in the cloud or ones that have been downloaded to your device to use offline. Next, you can filter by ownership. You can select all ownerships, “my images”, uploaded, free, Cricut Access, and purchased. You can also look for a specific type of image. 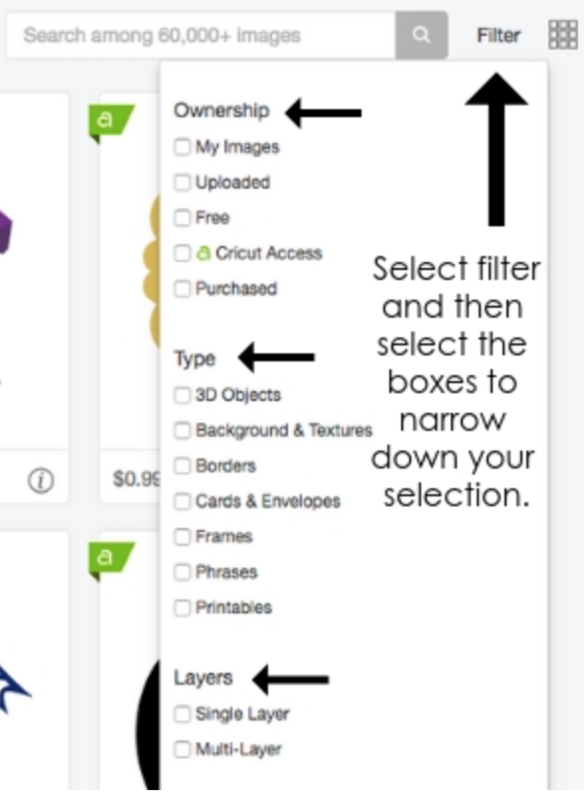 The options to filter by are: any type, 3D objects, backgrounds & textures, borders, cards & envelopes, frames phrases and printables. Lastly, you can select the layer type. You can choose any layer, single-layer or multi-layer. As you can imagine, searching for an image that is in the cloud, free, a border and single-layer will pull up significantly fewer images that you would need to look through to find the one that will work just right for your project. When searching for images, there are several things you may want to look at. First, if the image is included in the Cricut Access subscription it will have a little green banner and an “a” in the top left corner. At the bottom in the left corner is the price, or it will say “purchased” if you have already purchased it. To find additional information click on the “i” in the bottom right corner. A box will come up that says that title of the image, the ID number of the image and the cartridge or set that it is from will be hyperlinked. If you like the style of an image, you may want to click the link to the cartridge to see similar images. One of the most common issues that new Design Space users experience is when they have everything exactly where they want them on the Design Space screen, but when they go to cut it jumbles everything up on the cutting mat. By default, Design Space will rearrange the images to make the most of the materials you are using. If you want to keep things spaced exactly as you have them on the screen you need to select all of the images and then select attach. One of the best Design Space tips I can give you is for when you are wanting to write with your Cricut. There is a lot of frustration when someone goes to complete their project only to see that it just outlined the font, it didn’t actually fill it in. Sometimes it is hard to picture what a font will look like once it is drawn. The Cricut machine’s job is to read lines, whether it is to cut them or draw them. If you follow the line though, you will see exactly where the blade or pen will go. Most fonts will have outer and inner lines leaving a space that looks like it needs to be filled in. The font you choose for writing is extremely important; so important that Cricut has made specific“writing” fonts. They are fonts that consist of only one line and give you the look you are after when writing with your Cricut. The slice feature in Design Space allows you to take two shapes and cut one from the other. I think of it as a cookie cutter. A lot of frustration comes when you have the images selected, but the slice button is grayed out and won’t let you slice. The answer is always TWO! Anytime this happens to me I know that I somehow have more than two layers selected. Even when I think I don’t, I look in the layers panel and sure enough, I do. Design Space will never let you have more than two images selected when you are slicing. When working with fonts, especially scripts, you will most likely want to connect and WELD the letters. As you can see in the image, having the space between the letters isn’t as visually appealing as having them connected. Once you move them where each letter is overlapping the other, you have to WELD. The only way to get letters to create a single word that is cut as one piece is to overlap the letters and then WELD them. Sometimes you will want to know what the font is that you used, especially if you are going back to a project you already created. Design Space will tell you the font, even if it has been changed into an image by welding it. First, select the word and then click the small circle next to the word in the layers panel. It will open another box called “layer attributes”. Underneath the icons at the top there will be a small i and it will say “See image information”. Click on that and a box will open up that will tell you the selected font. This Design Space tip is for when you find an image that is almost perfect….but not quite. If there is an image that has parts in it that you don’t want, you can erase them! The contour feature allows you to remove cut (or writing) lines from an image. In the photo, the balloon has a face. To remove it, I ungrouped the layers to work with just the layer that had the face. I selected that layer and clicked contour. The box came up that allowed me to click the lines I didn’t want to cut. It’s as easy as that! There may be times you need a lot of one image or more than one whole project cut. You can copy and paste, but honestly, The easiest way to make more than one of something is to use the “project copies” feature instead. Once you have your image or project ready, go ahead and send it to cut. 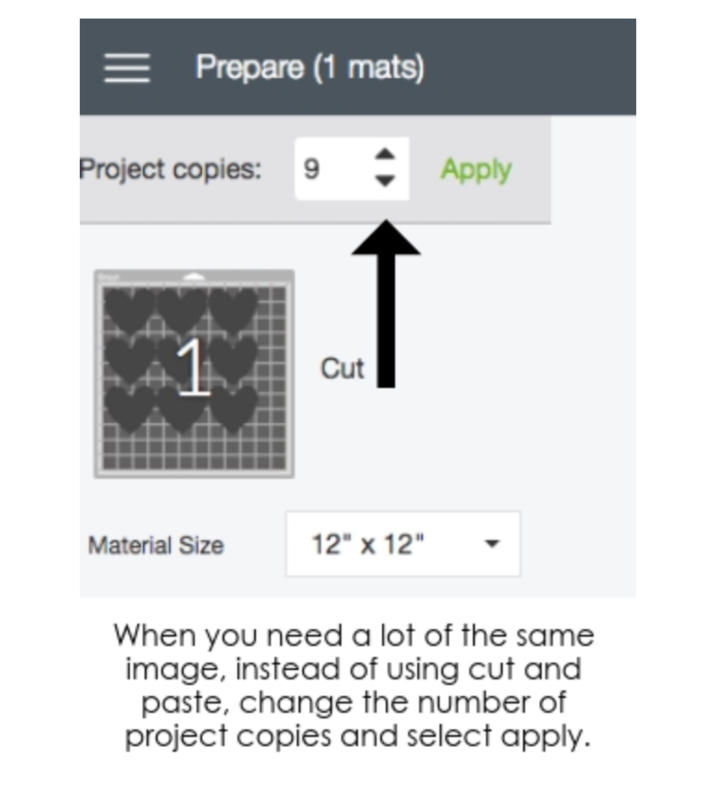 In the top left corner, you can enter in how many of the project you want and it will automatically put that number on the cutting mat. Easy peasy! Sometimes moving a cut will help you save more materials, or you may want to hide an image so it won’t cut. Once you get to the cut screen, you can rearrange images, move them from one mat to another and even hide them. 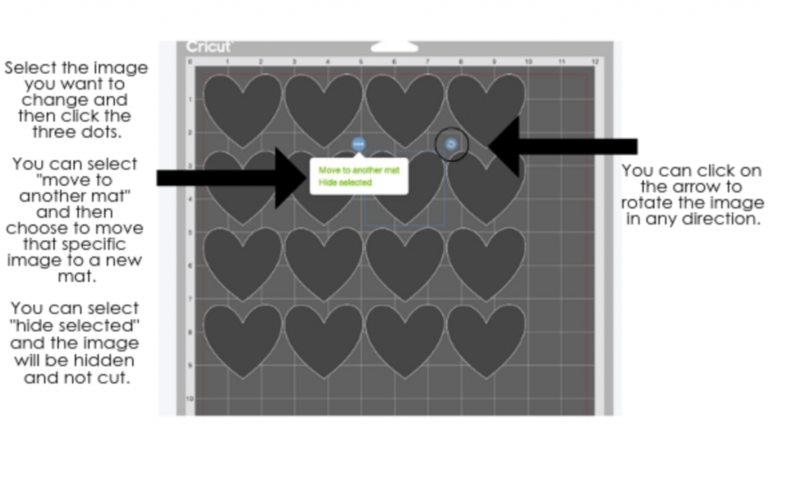 Want more Cricut Design Space tips and tricks? 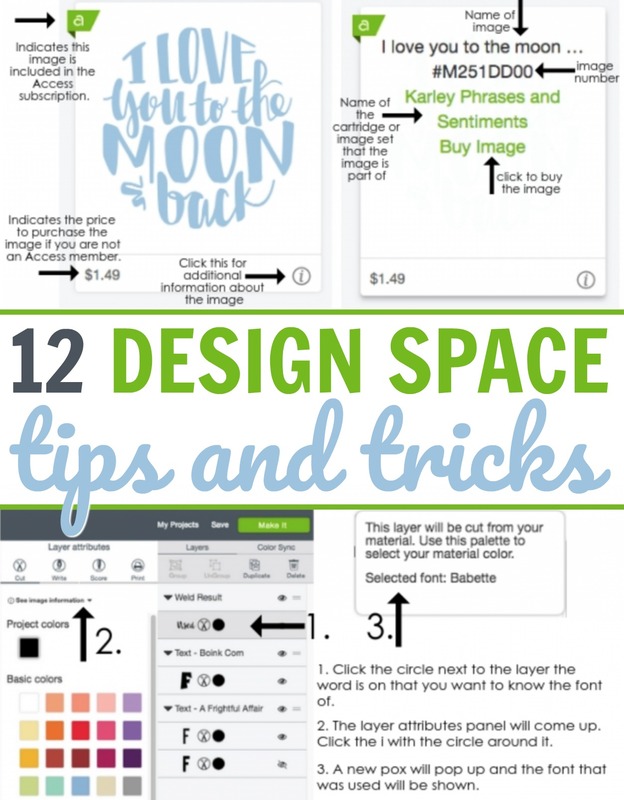 If these have been helpful for you, I would love for you to hop over to my blog, Creative Cutting Classroom, where I write about all things Cricut and Design Space. I was so excited that Tanner and Courtney invited me to write for you that I even made you a gift! I have a cheat sheet you can download that will show when to use weld, slice, group and ungroup, attach and detach, and flatten. Just click here and I will get it to you right away! I am so excited to be able to share my Design Space tips and tricks with you guys! Thank you SO much for having me! Thanks for sharing and I am going to start learning. I hope that I will enjoy your project.